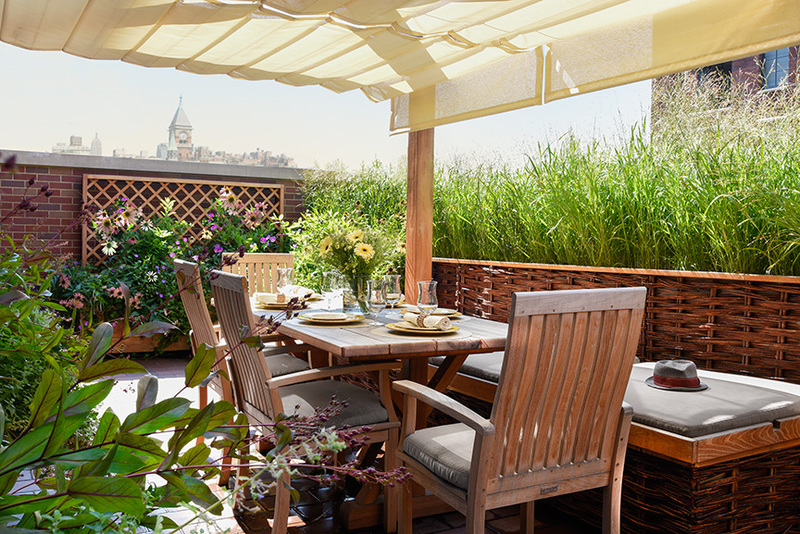 In the heart of the West Village, this 10 x 30 terrace is meant to evoke the client’s passion for a bucolic homestead on a ranch. The intent was to create a pastoral oasis within the urban metropolis. The space overlooks a courtyard and is surrounded by other luxury condos. Thus privacy was a key component for the client, which is achieved by the planting of switchgrass along the perimeter — evoking the prairie grassland. Two Serviceberry trees (Amelanchier canadensis) create additional privacy, their perfect alignment representative of a farmstead orchard, with the rustic pergola providing either structure or hidden sanctuary (by closure of the roman shade) for al fresco dining, cocktails and hammock lounging. The design aesthetic and inspiration is derivative of the farm. The daybed (storage within) and perimeter grass planters were faced with willow hurdles. The arcadian pergola element is fabricated with native black locust wood. Washboard planters by Pennoyer Newman and traditional horse feeders contain perennials. Built 2018.